Those of you that make salads know that there is sort of a "yin-yang" quality to a good salad. A good-tasting salad has the right balance of bland ("yin") and spicy ("yang") ingredients. Too much of one or the other can make a salad not very (or too!) interesting to the palate. 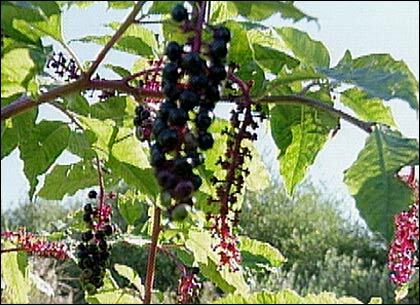 Fortunately there is a large assortment of edible weeds and other wild plants that fit into both categories. Note that there are no precise measurements to this recipe  all you need to do is balance out the blander and spicier ingredients to suit your own personal preferences. 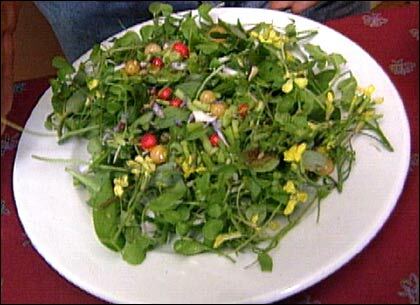 Russ tends to use chickweed as a base for an autumn salad, then use other items to add different flavors, colors and textures. Also note that there is no need for this salad to be 100  or even 50  percent wild; it's fun to add just a few wild ingredients to a conventional salad as well. Nevertheless, it does prove that you can make a wonderfully delicious and visually appealing salad using only wild and foraged ingredients. The stems taste like raw corn. Use instead of lettuce. Also called Wild Beet. Use instead of beet greens. Also called "cheeses" because of their resemblance to little cheese wheels. This plant is not a garden weed but is a common woodland ground cover, especially in conifer forests. The berries do not have much flavor but with their bright red color they certainly have high visual appeal  part of what makes food appetizing. These do not have much flavor but are a nice blue color, unusual for food. Also called Touch-me-not. These taste like walnuts. If you have the time and patience, you can slip off the seeds' outer jackets to reveal the beautiful bright robin's egg blue on the inside, though this is not necessary to eat them. We ground these up and added them to the salad as well as the gumbo. Like Partridgeberry, Spicebush is a common woodland plant in southern New England. Spicebush is in the same botanical family (Lauraceae) as Sassafras, and many, mostly tropical, members of the Lauraceae family have aromatic qualities that are used as food, food flavoring, or medicine. Other Lauraceae examples are Cinnamon, Camphor, Avocados and Bay leaves are all in the Lauraceae. A good substitute for broccoli. Like "wild" asparagus, "wild" horseradish is the same species as the garden variety; it just escapes from cultivation sometimes and becomes foraging fodder. A tangy substitute for lemon. Also called Husk Tomatoes. De-husked these are a sweet and colorful tomato substitute. Though you can make or use any dressing you like, a dressing made to taste from the following ingredients is delicious with this salad. Russ Cohen notes: Keep in mind that varieties and availability of wild salad ingredients will vary across regions and according to the time of year. The ingredients I chose for the 100% wild salad we made for the show largely reflect what weeds and other wild edibles are suitable for salad-making (i.e., tender and tasty in the raw state) in the Boston area at the time around the second week of October. For more information on edible wild plants, visit the Wild Food Adventures newsletter.